I would like to order probably 3 of these. What does the pass-through look like? Is it another cart slot + eci on the edge(so something like MIO could plug in), or is it a cutout (in the top) next to the existing cartridge slot? I'm interested... with a pass through and sound (and the enclosure if possible)... Just need the details. It is not very elegant, but it is the best I can do with a prefabricated enclosure. It is possible that for some hardware you will need to cut the left side of the enclosure even more. Also, please before ordering make sure you really need the ECI. I plan to make a bus extender as a separate device with a horizontal connectors. It will be much better solution for devices like Black box. I was also very supriesed by the extremely high demand for the Covox version. I hope that you all know what the Covox really is and that it has nothing to do with a stereo Pokey. Will the purchasers be notified, and how. Edited by _The Doctor__, Thu Dec 18, 2014 4:08 PM. i want one for the 800xl? the prototype phase are finished? can you give me the link via pm? I'll PM you, but cancel the ECI on mine. I have no idea how I'd use a vertical ECI. Sending PM for payment instructions. 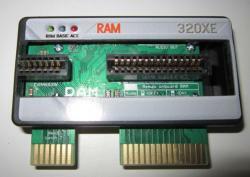 one board only for all the XL XE computers MIO BlackBox or other flat eci pbi devices with the other cart eci in a row across the top placed to put your memory expansions and other add ons as well as cartridges. sort of like the supra and icd cart adaptor boards. The Swiss Army Knife of PBI/ECI !!! Hello Ctirad, this is INDEED the kind of expansion i've been waiting for. I would like to order ONE unit for my 65XE, including Covox and enclosure. Are you sure you want to save a little over 2 US Dollar just because you can't think of a reason for having it? If you later on find a reason for using it, you'll kick yourself. Thanks, so much for the information, and the additional picture. I have decided: (1) screw the pass-through; this is the ONE device that I need for my ECI, just as my 800XL has a RAM320XL plugged into it which takes up the slot. I'm NOT going to be looking to plug anything else after that. The non-pass-through version looks better. (2) Covox really isn't from my Atari. I don't care. If it ain't POKEY then it ain't Atari-8-bit, to me. Don't need it. As such, I'll take 3 "regulars" - no covox, no pass-through. Just 576 glorious K.
I consider this a bargain. I am a big fan of your work (ctirad), and I will likely buy more from you in the future! Keep up the good work, man! It's not the money. I suspect that if push came to shove, I would solder on the small ECI connector. Anyway, if I decide that I want to use a PBI device with this expansion, I'll attach a regular 90-degree connector in place of the attached cartridge connector (+ small ECI connector). I think I'd rather not hack out the top of the case for the additional connector. Edit: But probably good to have the connector on hand, so I changed my order to have him include the part *unsoldered*. how, exactly, do we use this thing? You plug it in, you get RAM. Looks interesting. Where exactly is the COVOX mapped into memory?